The normal levels of hemoglobin in the body range vaies in males and females. A deficiency of hemoglobin would decrease the oxygen-carrying capacity of the blood. This also decreases the number of red blood cells resulting in a condition called anemia. Causes of low levels of hemoglobin levels include poor nutrition, certain diseases affecting the bone marrow, chronic diseases like cancer and kidney disease, blood loss, certain drugs and cancer therapy. Low levels of hemoglobin contribute to a variety of symptoms such as dizziness, lethargy, pale skin, and if severe, result in organ damage. 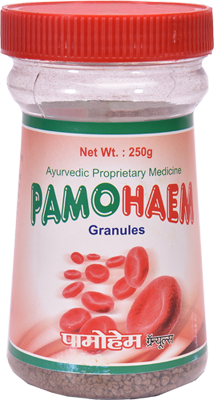 Pamosa introduces PAMOHAEM....this medicine helps the individual to improve his hemoglobin content & effectively to treat iron deficiency. This leads to proper bone growth & maintains all round health . With improved hemoglobin levels we lead an energetic & "youthful" life. Rich in Calcium, Iron & micro nutrients having anabolic properties. Provides rich source of highly absorbable natural calcium having anabolic properties. Contains microfined iron -complex which forms quick absorbing colloid. Contains micro- nutrients necessary for toning up metabolism. Builds up healthy blood & strong bones. Shatavari helps the immune system recover more quickly from exposure to toxins by protecting blood-producing cells in the bone marrow and by enhancing the production of immune-regulating messenger molecules. Increase in haemoglobin level and haematocrit value and increase in total RBC Indicated for anaemia, oedema and used as immunomodulators. Potent antioxidants which helped in reducing gastric ulcers. Effective in decreasing blood cholesterol levels, triglycerides and serum and tissue lipid profiles. Extremely rich in many nutrients, antioxidants, vitamins, essential fatty acids and minerals, high content in Vitamin C (a powerful antioxidant) GLA and potassium. Reduces the effects of arthritis. Rich in other essential nutrients like calcium, magnesium and vitamin B6. Both magnesium and calcium are needed by the body for proper bone growth while vitamin B6 is needed to break down protein, maintain normal levels of nerve function.